June | 2014 | 50 Westerns From The 50s. An Update On The Alamo’s Restoration Concerns. There’s nothing I can type here that will get across how sad and angry this makes me. Thanks to Paula for bringing this to my attention. 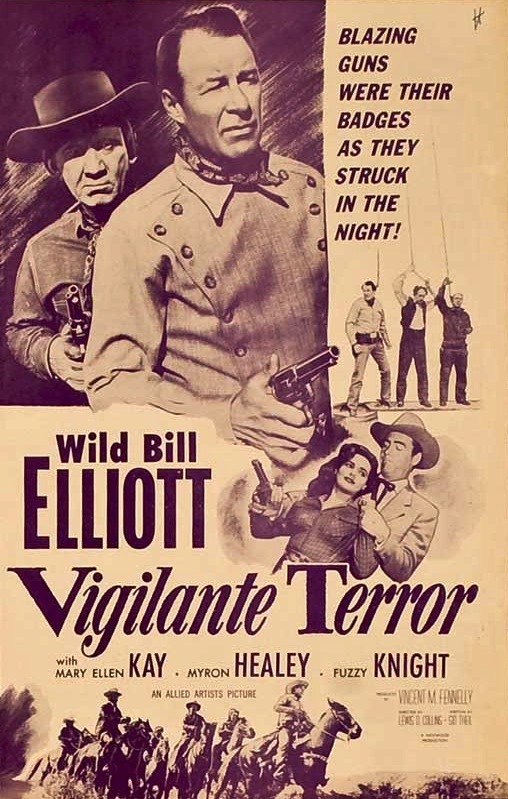 Wild Bill Wednesday #5: Vigilante Terror (1953). 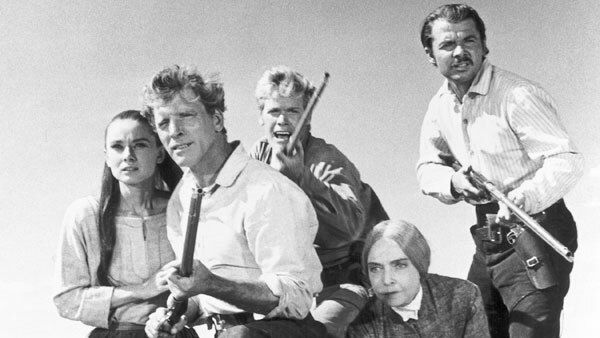 CAST: Wild Bill Elliott (Tack Hamlin), Mary Ellen Kay (Lucy Taylor), Robert Bray (Gene Smith), Stanford Jolley (Matt Taylor), Henry Rowland (Mayor Winch), Myron Healey (Brett), George Wallace (Brewer), Fuzzy Knight (Strummer), Zon Murray (Bill), Richard Avonde (Artie), Michael Colgan (Jamison), Denver Pyle (Sperry), Lee Roberts (Wilson), John James (Jed Hamlin). Things have gotten so bad that the citizens of Pinetop have formed a vigilante committee to maintain order, but the Brewer gang continues to operate. (And the vigilantes seem almost as bad as the outlaws.) Tack Hamlin (Wild Bill Elliott) comes to town and is soon recruited for sheriff, and he gets right to work, trying to stop both the bandits and the masked vigilantes. Turns out that Brett (Myron Healey), who owns the saloon, leads both the outlaws and the vigilantes, planting false evidence to avoid suspicion. This is a good entry in the series of Westerns Elliott made for Monogram/Allied Artists near the end of his career. By this point, his “peaceable man” persona was well established, and he goes about his business with his typical cool determination. The sequence about halfway through the picture, as Elliott the newly-appointed sheriff cleans up the town, is terrific. 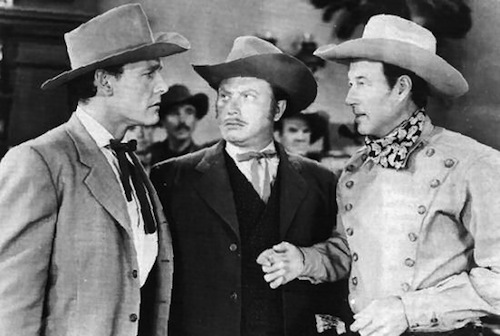 Later, the vigilantes drag Elliott and Fuzzy Knight to the hanging tree, making for a very tense scene that illustrates just how tough the B Western became in its final years. What’s more, in the climax, one of the Brewer gang is shot in the face! Fuzzy Knight is great as Elliott’s old friend and deputy. They have a good chemistry together. Mary Ellen Kay does well with a pretty limited part, and makes quite an impression toward the end when she picks up a gun. The badguys, from Myron Healey to George Wallace to Denver Pyle, have locked horns with Elliott before. Same thing behind the camera, from the director (Lewis Collins) to the writer (Sid Theil) to the editor (Sam Fields) and on down the line. Of course, we all know the familiar Iverson and Corriganville locations. Vigilante Terror is not available on DVD, though it’s one Warner Archive will probably get around to one of these days (that’s a hint, Matt). Watch for it. 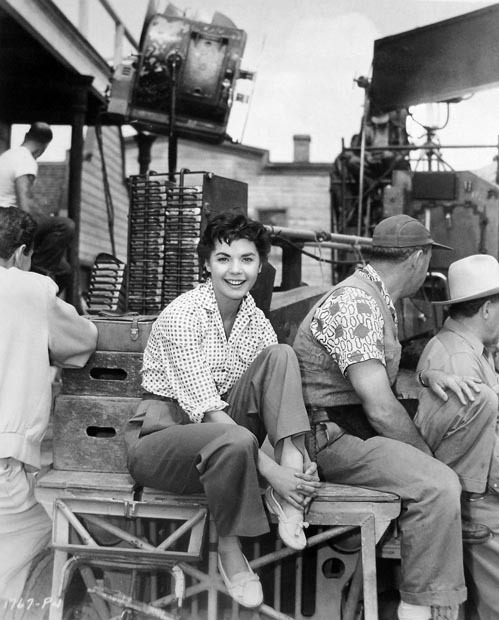 Making Movies: Four Guns To The Border (1954). 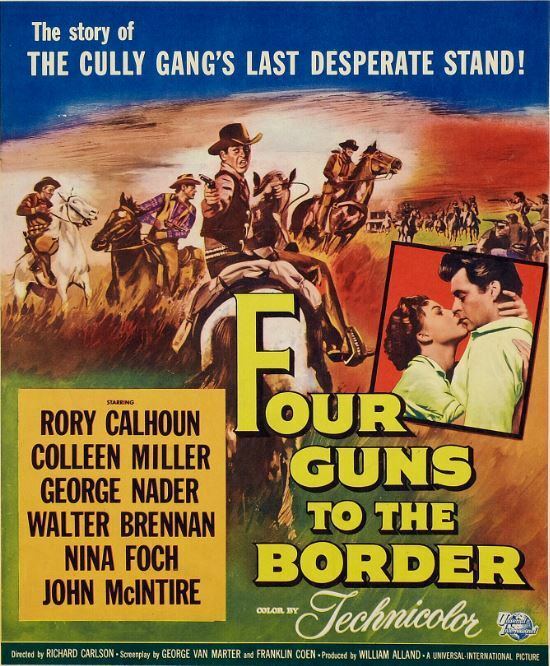 Four Guns To The Border (1954) is an excellent 50s Western from Universal-International. It’s a hard one to track down, unfortunately. The picture gave actor Richard Carlson one of his few directing credits. He does a tremendous job; wish he’d done more. 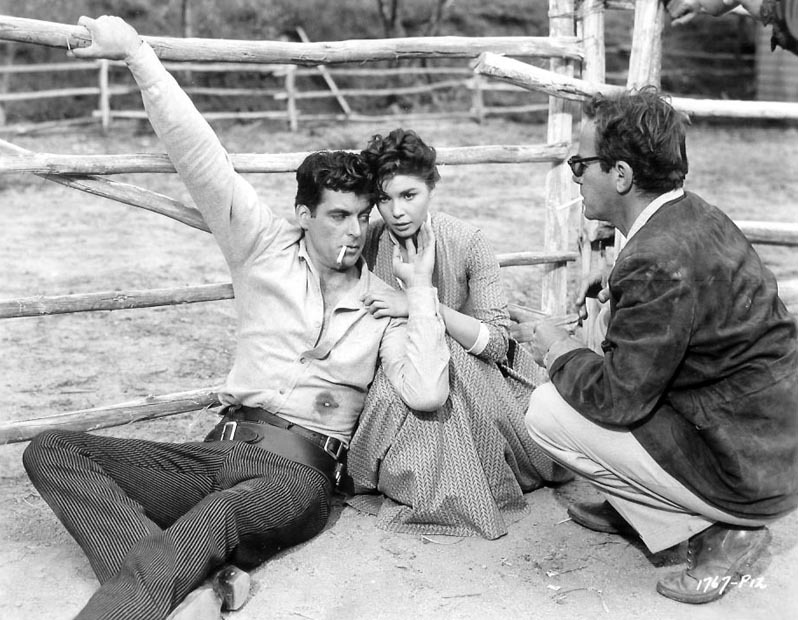 Here, he’s working with Rory Calhoun and Colleen Miller. Here’s Colleen Miller on a Western street. Iverson, maybe? 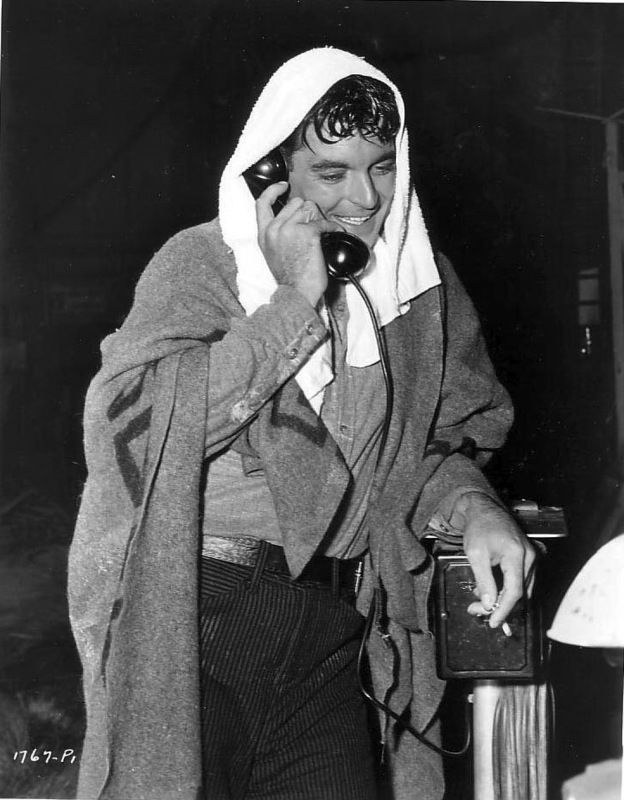 Rory Calhoun takes a phone and cigarette break. Here’s Miller again, this time with George Nader. The terrific cast includes John McIntire, Walter Brennan, Nina Foch, Jay Silverheels and Nestor Paiva. Will get around to a real post on it soon. Why isn’t this thing on DVD? Laura told me last night that Martha Hyer had passed away at 89. Her list of credits reads like a checklist for my cinematic upbringing: a bunch of 50s Westerns (including a few Tim Holt pictures), an episode of The Lone Ranger, Abbott & Costello Go To Mars (1953), Bikini Beach (1964), even an episode of The Beverly Hillbillies. She turned up a lot, which was fine by me. I always liked her. In 1966, she married producer Hal Wallis, not long after appearing in his The Sons Of Katie Elder (1965), alongside John Wayne and Dean Martin. After his death in 1986, she moved to Santa Fe and lived there till her passing. Click on the shampoo ad for an obituary. Note that the ad promotes one of her best 50s Westerns, Red Sundown (1956). It’s a favorite of mine — and of many of you out there. 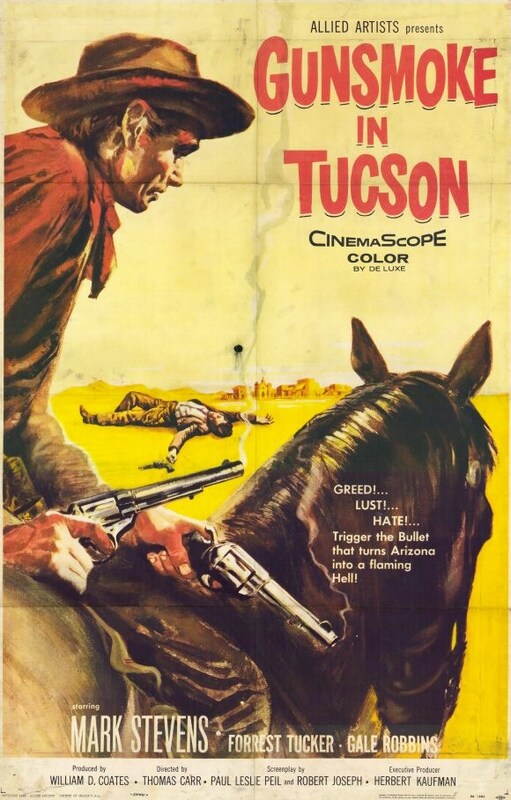 50s Westerns DVD News #150: The Unforgiven (1960). On August 12, Kino Lorber will be bringing The Unforgiven (1960) to Blu-ray and DVD. It has an amazing cast: Burt Lancaster, Audrey Hepburn, Audie Murphy, Lilian Gish, John Saxon, Charles Bickford and Doug McClure. 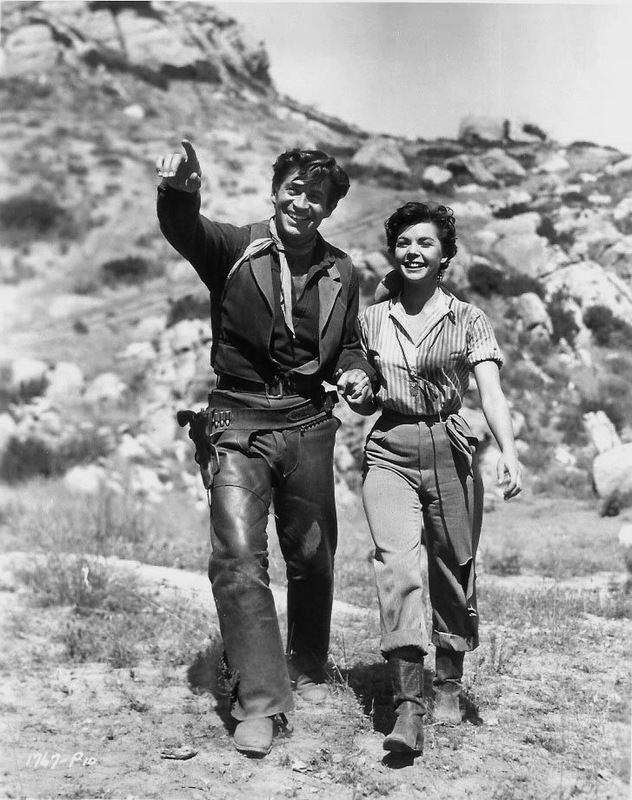 It’s based on a novel by Alan Lemay, who wrote The Searchers. Audrey Hepburn broke her back during this film, a few crew members died in a plane crash and John Huston abandoned the film during post-production (some say he was detached long before that). People’s opinions of this one are all over the place (I’m kinda in the middle), but one thing’s for sure: even up against heavyweights such as Lancaster and Hepburn, Audie Murphy really shines. He alone is worth the price of admission. Thanks for the tip, Paula.